Access International Academy Ningbo is an international school in the Beilun District of Ningbo, China offering educational programs from Nursery to Grade 12 to students of 28 nationalities Access International Academy (AIAN) offers classes from nursery to high school for students in the greater Ningbo area. 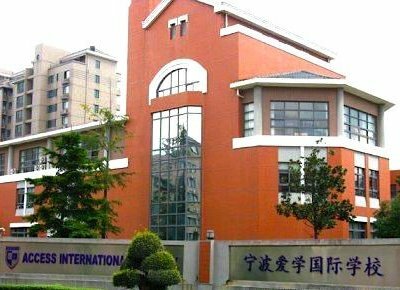 AIAN is accredited by the Western Association of Schools and Colleges (WASC), is a member of the Association of China and Mongolia International Schools (ACAMIS) and the East Asia Region Council of Overseas Schools (EARCOS). AIAN offers an American-based college preparatory program combined with an international flavor. Advanced Placement courses to obtain college credit are offered in the high school. The AIAN student body is comprised of students from over 20 different nationalities. Faculty members are predominantly from the United States. The teacher-pupil ratio is approximately 1:4, which promotes individualized instructional practices. The After School Activities (ASA) program is developing into an all-around selection of activities based on student needs. The teachers and students are supported by six teaching assistants and nine office staff. The school also enjoys the support of canteen, janitorial, and security personnel. This team of qualified, caring professionals provides a nurturing and challenging learning environment where students thrive. Location as living in Beilun. It is recognised and supported by WASC and follows an American curriculum. Too many teachers have been unquaifed and not experienced in the subject they try to teach such as economics, ELL, psychology, elementary and art. Many have been hired for their religion as they belong to a group. Teachers should be native speakers, essential if they are teaching English. Some teachers make bad English mistakes and also smoke cigaretes, dress messily, that students can see. The school board is not good and does not know what they are doing and the head of the school can be rude and untruthful when parents ask questions. The facilities need improving such as a better cafeteria and better sport faciities. Ask to see teacher qualifications. Ask to see curriculum and ask how they help Korean/American students to get ready for return home. Ask how long teachers stay. I can walk to school. There is not much homework. I have tow nice friends. We mostly get to do what we like. Better teachers who speak English well. I hate the head of department who gives lots of favors to special students including a fat lump of a kindergarten teacher's kid who gets A grades for everything even though she is dumb. who are always sneaking out to smoke and drink. The music teacher can't play an instrument or teach music and is really lazy and gives everyone grades A. The art is rubbish and the art teacher just shows off his own trash work and not the students. The science teacher is an Indian with bad English and no proper qualifications. The English and maths are crap teachers. They only good teachers we had quit last year! Don't do. go look at schools in Ningbo where there are more students, real teachers and where you can get a life and an education. Plus Points: Save money as nothing to spend it on in Beilun apart from local bars. The undemanding admin who allow anything to go. Housing is OK depending on your relationship with admin. ASAs are minimally demanding. Small class sizes. Can ride around on a bike or e-bike. The principal and admin team all need to be replaced and qualified, experienced educators hired. Some teachers are incompetent and lazy but survive based on friendship with admin. Academics: ELL program is barely existent despite three teachers for a small number of kids. Music, art and science all need fresh teaching blood and enthusiasm. In winter months, the place is freezing cold and no proper heating system only air conditioners that have to be cranked up to high heat. Some teachers are unpleasant and back-stabbing gossips. If you find it hard to get a job elsewhere due to lack of qualifications or a bad reference and don't want any demands, this is the place for you. You can happily cruise for two years but if you are honest and hard working, this will not enhance your teaching experience.In fact, if you put much effort in, your colleagues will hate you for showing them up. As a male teacher, if you have a Filipino wifelet, this is a huge plus and the principal will immediately hire you. Only arrive with no expectations and you won't be disappointed.